NYLET - Fine Products - Quality First - Everything for the model yachtsman since 1932. 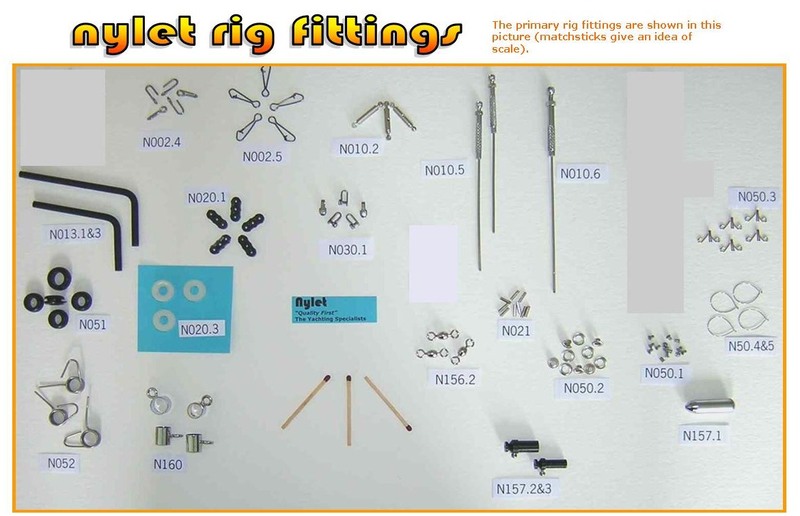 Nylet model racing yacht fittings, screws, tools & accessories, since 1967. Also aluminium tubing (incl 7075). IOM rig bags & folding yacht stands. 'How To' booklets. See other pages for more products. World-wide Mail Order Service since 1958. Look in our price list first, over 600 items (fittings in section 3). 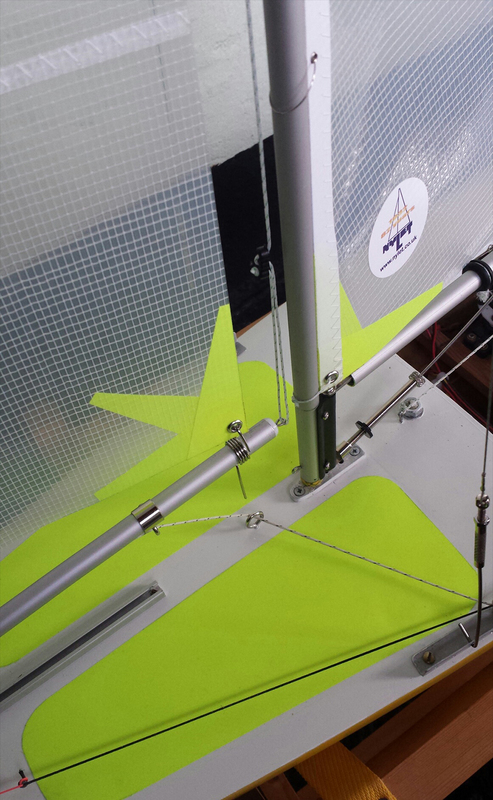 We offer a wide range of top quality mast & deck fittings for model racing yachts, including rigging screws, bowsies, chain plates, deck eyes, spreader sets and kicking straps, etc. as well as a large selection of cordage & wires and stainless steel & brass screws & nuts. Rig fittings packs and deck packs are also available for IOM, Marblehead and 36 inch yachts (see price list). We suggest that you look at the photos of fittings to be sure that you select the parts that you require. We offer a quick turnaround on orders thanks to our high stock levels. The fittings we list are those that are currently in production, see section E in our price list (click on 'main pages'). Aluminium tubing for masts & booms, also available in 7075 (stiffer) quality. Nylet 'How To' booklets & books, see section A in our price list. Tough IOM rig bags with 3 compartments and carry handle. Also folding IOM timber yacht stands and lead ballast, also range of sail winches. For more detailed info just click on any of the "read more" buttons. Click on 'contact us' for phone numbers/email/postal address. Please see customers comments on this and various other pages. Unsure what different fittings are called? One of the 'help' pages, this one on yachting/sailing terminology. A general view of fittings on an earlier Spirit Mk2 IOM yacht. Mast and deck fittings are available as separate items and also packs (see our price list). 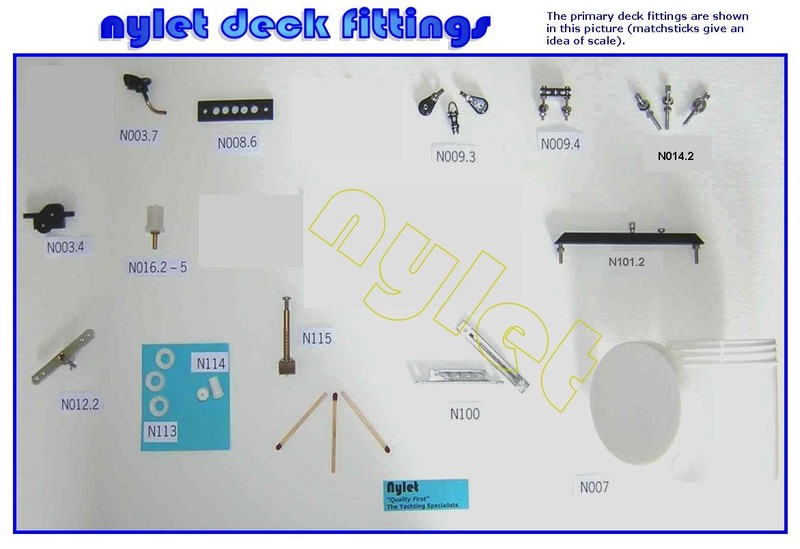 Quality products - Nylet yacht fittings, manufacture commenced 1967. For the full listing see our price list; go to the drop down list - click on 'main pages' for the link. For the full listing see our price list. Some fittings in more detail. A closer view of the kicking strap (vang) area. 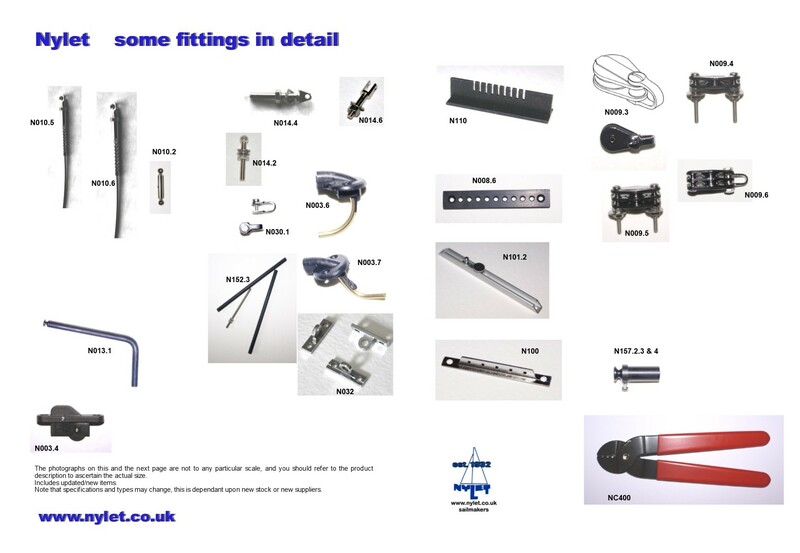 52 years of Nylet model yacht fittings - Fine Products - world-wide mail order SINCE 1958. We offer quality mast & deck fittings for racing yachts, including rigging screws, bowsies, chain plates, deck eyes, spreader sets and kicking straps, etc. as well as a large selection of screws & wires and cordage. Rig fittings packs and deck packs are also available for IOM, Marblehead and 36 inch yachts (see price list). Quick turnaround on orders thanks to our high stock levels. The fittings we list are those that are currently in production. See the price list for other items such as 'How To' booklets & books, IOM rig carry bags, lead ballast & folding yacht stands, sails & sail winches. Many thanks for your very prompt and accurate fulfilment of my small “bits and bobs” order. Many thanks for the BB3 booklet which has already provided loads of common sense stuff which I'd not originally appreciated. The materials/fittings you sent also had a quality 'feel' to them. I'm sure I'll be contacting you again soon. Order received today, many thanks for your attentive service and excellent quality items. The items I have already had from you are amazing quality, especially the rigging screws with their L/R threads, I had no idea such things could be bought. Brilliant. Hi Frank, received with thanks the very next day, great service! Many thanks for the boat fittings which arrived beautifully packed yesterday. Nylet fittings are on my Squiggle (sail number 90) built by Bill Curtis in Falmouth, on the green Chinese E Class boat and on the red & blue Chinese IOMs which until recently I owned. I have sold both these boats to Chinese guys in Shanghai so your fittings are now being used by 3 Chinese boats, plus me! J.Parsons ~ F.Parsons ~ Nylet. 1834-2019 ~ 5 generations ~ 185 years of manufacturing. Just a note to confirm that the parts arrived safely today and to thank you for your excellent service. Hi Frank, the postman has a fast bicycle! Order arrived this morning (next day), all OK excellent service.